After a hard week of homework, exams and a seemingly endless parade of online response journals, it’s normal to want to sit down and watch a television show that takes your mind off all the other homework that’s due next week. 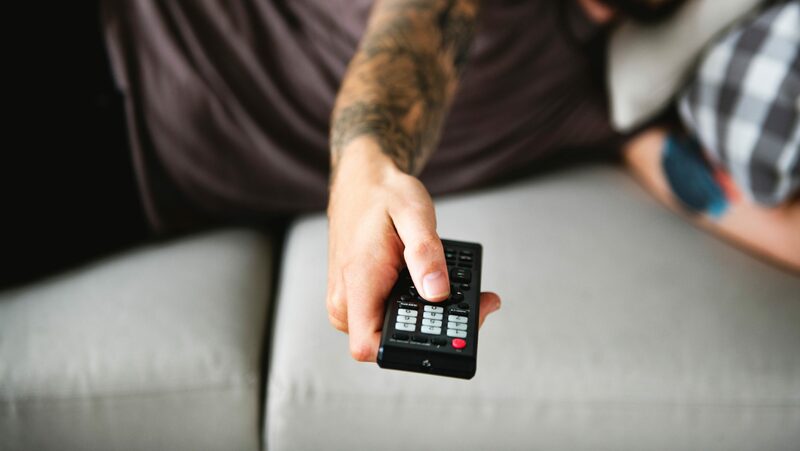 TV shows offer a rare and accessible form of escapism to the college student who may not have the means to travel or experience other more costly forms of recreation. Finding a particularly relatable TV show is like finding a song that so perfectly reflects how you feel, it makes you question if you wrote it yourself. Even if it’s fictional, it feels good to see someone go through something you’re experiencing yourself. This capacity television has to act as a mirror to our mental and emotional reality is important because while they also offer a mental escape from the day-to-day monotony of college life, they may also offer something much more valuable: catharsis. Here are a few shows which offer that to college students. At first, it seems incongruous to compare an animated TV show about a depressed anthropomorphic horse to the daily stresses of university life. However, when examined more closely, the parallels become clear. 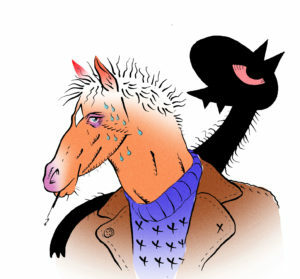 Ostensibly, “BoJack Horseman” is a show about a washed-up celebrity who also happens to be a horse. But at second glance, the show quickly becomes much more compelling as it deftly and nimbly satirizes our chaotic and unstable contemporary moment. “BoJack Horseman’s” cast of animal characters are written in such a way that makes them feel more human than most actual humans on TV. They fall in love, they get divorced, they’re unkind to each other and regret it later on. They’re manic and anxious, depressed and overstimulated. And they’re experiencing all these emotions against the backdrop of a fictional Hollywood landscape that’s overly obsessed with material wealth and social capital. Another show which encapsulates college life is—unsurprisingly—another Netflix Original. The new animated show, “Disenchantment,” sheds a more hopeful spotlight on youthful alienation. The show, set in medieval times, follows Princess Bean as she navigates a royal life she never wanted but has no choice but to fulfill. From the premature death of her mother, to an arranged marriage, Bean doesn’t have much control over her life, a feeling many college students can relate to when their lives are dictated by class schedules, jobs and graduation requirements. 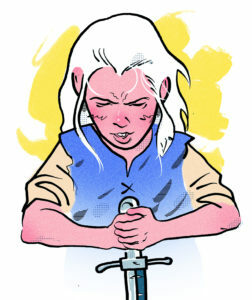 Throughout the series, Bean feels constantly pulled in different directions as she struggles to balance her princess duties, her father and her new friendships. She often finds herself caught under the oppressive weight of social expectations placed on her by an environment that neither understands her nor really cares if she’s understood. 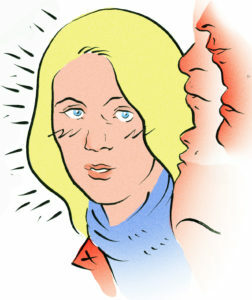 Bean finds herself in a similar situation as she becomes increasingly alienated from her kingdom and her father, the king. Finding yourself quickly immersed in new environments, whether they be college campuses or medieval kingdoms, can be a significant source of anxiety for many people. And if anything, college life is primarily a succession of new environments that one must adapt to. College students have also found their lives reflected in the CW Television Network hit show “Jane the Virgin,” which chronicles the life of Jane Villanueva as she navigates her young adult existence. After vowing to stay a virgin until marriage, Jane becomes accidentally artificially inseminated by her doctor during a routine checkup. “Jane the Virgin’s” subtext is easily the unpredictability of life and how difficult but necessary it is to overcome these unforeseen obstacles. This is a sentiment a lot of college students can relate to, as college life is primarily composed of a seemingly endless procession of obstacles and hardships that must be overcome. Throughout the series, Jane is forced to balance her professional writing career with the raising of her son and her search for love like a domestic circus act. Student life is an equally ambitious undertaking as responsibilities and obligations start to resemble spinning plates precariously balanced on the thin and feeble sticks of mental health. But, like any other decent television show, “Jane the Virgin” does not abandon its audience to wallow in the uncertainties of life. It offers them a ray of hope as it highlights Jane’s support from her family and the love of her growing son. College life is also about choices. Sometimes the right ones are made, and sometimes they’re not. But, the most hopeful point the show makes about those choices is that no matter their outcome, no matter their unpredictability, life goes on. And, there’s always another chance to make a better choice. No TV list would be complete without the inclusion of the 2007 CW hit, “Gossip Girl.” The New York-based TV show follows two drama-filled lives of apparently very bored teens as they navigate the tense social environment of Manhattan’s Upper East Side. It’s easy to see how college students could draw parallels between the social minefield of upper class Manhattan elites and precarious college relationships. Many new students find themselves being introduced to a new environment with a set rules and customs that may seem alien at first. Georgia State student Cameron Zapata agrees that the show does a good job of showcasing how hard and how rewarding assimilating to a new environment can be. “College is about navigating a new, unknown ‘world’ and even in the beginning seasons there are characters who are stepping out of their ‘known’ world like Dan Humphrey,” she said. This type of scenario also plays itself out in “Gossip Girl,” as Dan Humphrey navigates his new life among the wealthy New York teens and a seemingly omnipresent blogger whose sole reason for existence is to pit the young New Yorkers against each other with petty gossip and witty, but cruel, blog headlines. In retrospect, the show’s emphasis on petty internet culture and its ability to divide people seems way ahead of its time considering Facebook was only three years old and Twitter was only one at the time. Its exploration of toxic internet culture seems uncharacteristically prescient for a CW teen drama. Undoubtedly, many college students can find value in this early internet cautionary tale. It’s also quaint to look back on the simplicity of their flip phones and SMS-based blogging compared to our hellish, complicated internet landscape.